the farther away the world floats the deeper into the mists. as the moon moves once again across a brilliant night sky. Koans are those brilliant paradoxes zen buddhism uses to pry the mind open, I think they’re important aids to handling complexity, and I have a post about them coming up shortly. 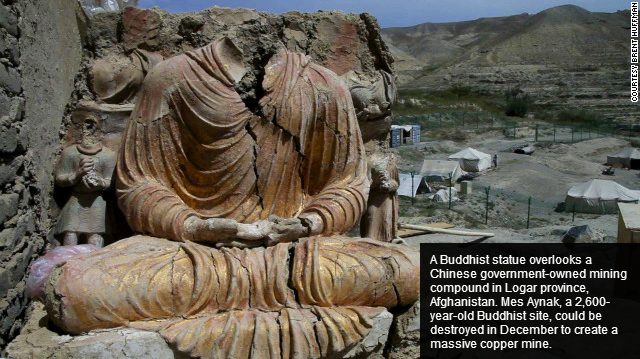 Here, it’s enough to say that the issue of copper mining vs archaeology in Mes Aynak seems to me to be a living, breathing koan. It’s awkward, when you write an “ekphrastic” poem, a poem about a painting or photo, to have the image right there when the poem is read, because it trammels the reader’s mind in much the same way that a film can trammel the mind of a reader into “seeing” only the film-maker’s Gandalf, no longer her or his own. And I’m going on at some length about this, because next up is the image from which that particular poem was built, but I’d like the image to be, as they’d say in the newsprint world, “below the fold” as you read the poem. The koan of balancing material with immaterial values remains, but in this circumstance the likelihood of local Afghans receiving litter or nothing from the mining project likely tips the scales. But then he’s another wild-card in the continuing Great Game, isn’t it?